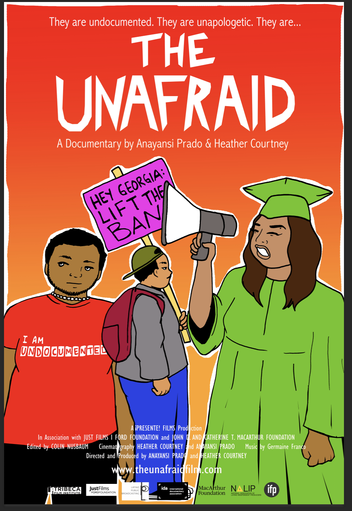 THE UNAFRAID is a feature length documentary that follows the personal lives of three DACA students in Georgia, a state that has banned them from attending their top state universities and disqualifies them from receiving in-state tuition at any other public college. Shot in an observational style over a period of four years, this film takes an intimate look at the lives of Alejandro, Silvia and Aldo as they navigate activism, pursuing their right to education, and fighting for the rights of their families and communities. THE UNAFRAID shows us what it means to grow up both American and undocumented in the United States. Presented by U-Lead Athens, two of the featured characters, Aldo and Alejandro, both grew up in Athens and are leaders in and graduates of U-Lead Athens. Donations to U-Lead Athens Scholarship Fund are welcome, and will help continue the non-profit's mission to get academically qualified immigrant and children of immigrant students to the colleges of their dreams. ENCORE SCREENINGS: October 13-14 presented as part of our Latin American Film Series celebrating Hispanic Heritage Month, featuring a post-screening discussion, and a visual art exhibit showcasing works by U-Lead student artists! Sponsored by the Latin American and Caribbean Studies Institute at UGA, screening admission is FREE and open to the public.